Gougane Barra - Reflections is an oil on paper and depicts one of my favourite places. Gougane Barra (Irish: Guagán Barra, meaning "the rock of Barra") is a settlement, situated in a beautiful peaceful spot, west of Macroom, on the road to Bantry in County Cork, Ireland. The name Gougane Barra comes from Saint Finbarr, who is said to have built a monastery on an island in the lake nearby during the 6th century. The present ruins date from around 1700 when a priest called Denis O'Mahony retreated to the island. 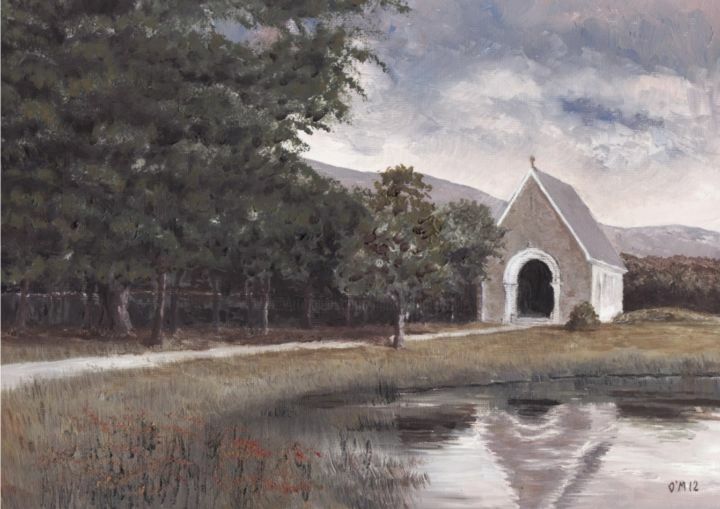 During the times of the Penal Laws, Gougane Barra's remoteness meant that it became a popular place for the celebration of the Roman Catholic Mass. The nineteenth century oratory which stands near the original monastery is famous for its picturesque location and richly decorated interior. A set of limited edition prints, signed and stamped by the artist, is available; email Mícheál for full details.